I am the proud owner of two church fans. Yes, like… old school, we-don’t-need-no-music-or-air-conditioner church fans. But what they represent reaches beyond my upbringing in “a nondenominational church with charismatic leanings and (the perception of) clear doctrine on everything from Genesis to Maps & References”. These two fans, how they vary, and how they ended up in my possession speak to the evolution of a churchkid. In my entire life (and I do mean EN.TIRE), I have been involved with ministry. To clarify, what’s true and real to me is that ministry is a) sensing a need, b) feeling a pull or call to address that need, c) growing internally from your service to that need, and d) authentically walking along the spiritual process of life with people. Sometimes, this was formal ministry and sometimes it was informal. I spent a great deal of my childhood on the children’s choir, reading the church announcements, and eventually preaching sermonettes as a teenager. I could literally feel that I was being primed for formal ministry. In college, I served as the official Director (and the unofficial chaplain) of a gospel choir. 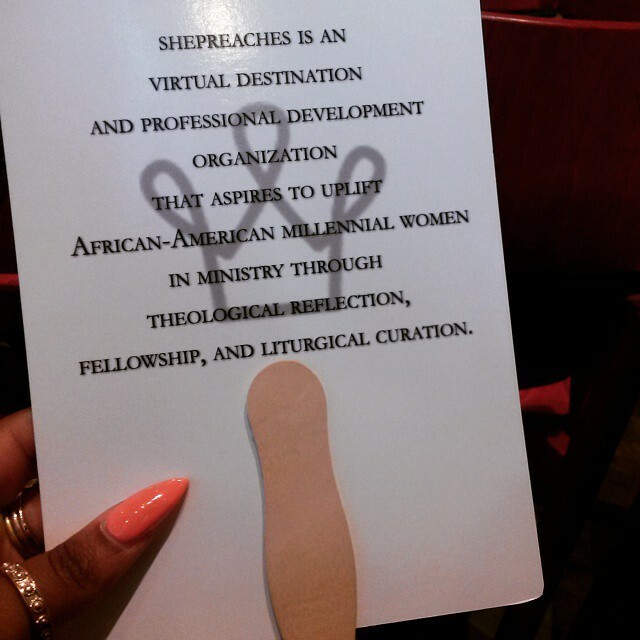 After college, I volunteered to assist in the diversity initiatives of a campus ministry. A few churches invited me back to preach (at the same time my previous partner suggested that women should not preach because… 1 Timothy 2:12). However, I was raised in a home of independent thinkers, so in retrospect, it really is no surprise that I went through a foundational crisis of faith shortly after college. I declined speaking / preaching engagements, left my church, and began attending a super Reformed church with intellectually rigorous sermons. Perhaps, subconsciously, I thought that somehow I could intellectualize away my doubts & demons through the exegesis of the men I called pastor. I sang alto on the praise team and attended weekly Bible study small groups. It wasn’t too long until they asked me to minister in the capacity as a leader for one of the weekly groups (they didn’t believe in women pastoring but had no problem with women “ministering”). But. then. came. grad. school. My already unraveling faith began unraveling even further. Though I was studying higher education, the intellectual rigors and encouragement of critique & analysis fostered the freedom to critique my own theology, as well. At first, this was absolutely petrifying, but the feeling gave way to a freedom I’d never known. It was the freedom of knowing that I was NOT alone in thinking that interpreting theological texts & affirming doctrines which supported exclusion of ALREADY marginalized groups was… well… problematic. It was the freedom to discuss truth & Truth. It was the understanding that the way we interpret ANY text (including Biblical text) has a lot to do with our sociocultural lens. [From what I hear, this is very similar to what happens in seminaries]. And all of this was happening alongside writing M. Ed papers on identity development in higher ed & a break-up with my ministry-boo. Ha! So, at that time, my refrain was, “Don’t ask me to speak. Don’t ask me to sing on the praise team. Don’t ask me to watch the kids in Sunday school. Don’t ask me NAN (nothing / anything)”. So, the church I was attending at the time simply encouraged me, talked with me, and invited me to eat with them [I could get really deep here on how this is the work of the church as well, but #wordcount]. However, as time went on, I felt “called” in a very different way: to provide space for people who were asking similar questions and exploring new theologies. This wouldn’t happen in any huge, major way. It would happen in a quiet corner of cyberspace. It would be ministry that really didn’t feel like ministry at all… just a way to work some things out in my own life & encourage others along the road, if possible. And so… on a Good Friday night in April, receiving the fan that says, “She Preaches” felt like nothing less than an affirmation. 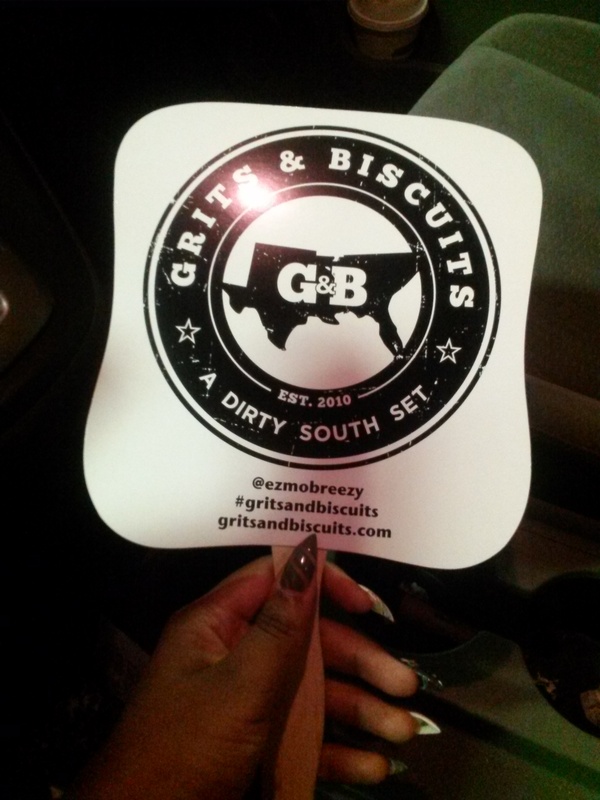 As stated on their website, Grits & Biscuits is “a premiere entertainment concept that celebrates the southern experience through urban music, cultural connections and nightlife moves in a down home environment”. What that really meant was a lot of Ludacris, Mystikal, Trina, Lil’ Wayne, etc. and wear your comfortable shoes because #twerkteam. After ordering drinks for both of us, the DJ said, “I have a suggestion… don’t use your church fans until you REALLY need them. It’s gonna get hot in here. You’re gonna be dancin’ & sweatin’. So don’t use the church fans until you REALLY need them to preserve the integrity of your church fan…” He let the beat rock a little bit, grabbed the mic again and said, “These church fans are Jesus-approved… let Him use ya”. And everyone danced harder. If I could describe the feeling of watching everyone completely enraptured in dance, I would. But I can’t. Not with words. Yet, I do know that I needed to be there… just as much as I needed to be at the Good Friday service last April. I looked at the ShePreaches churchfan in my living room & the Grits & Biscuits churchfan in my car. Two physical reminders that the sacred and the secular really aren’t that far away from each other. Two physical reminders that reshaping your theology requires you to take risks: to analyze in written / spoken forms and to take those moments of expression on the dance floor (aka the turn up). Even if you’ve got church in the morning. Especially if you’ve got church in the morning. Oh Jade! You don’t know how much your posts about your spiritual growth speaks so much to where I am right now. Each time I read them I’m like, “Yas!” The hardest part of this process is feeling isolated. Knowing someone else shares the same experience helps a great deal. Keep writing!